The Denver Botanic Gardens are worth a visit just because of the gorgeous flowers, the fascinating plants (I always discover new ones), and the inspiring color combinations. Now they’ve outdone themselves. From now through November, 2014, the blooms and water features provide a backdrop for Chihuly’s huge glass sculptures. 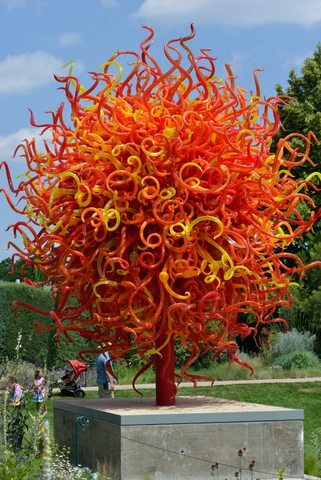 Dale Chihuly is a famous artist for good reason. He creates shapes out of glass that look as if they grew by themselves, probably underwater. Think jellyfish, or sea anemones. I’ve seen chandeliers composed of hundreds, of separate glass pieces all painstakingly fitted together into one organic whole. Incredible! You can see his work at museums all over the world.